Singapore's 4 beloved seafood restaurants have arrived. luxuriously and carefully served and bursting with flavor. so we invite you to enjoy many elegant foods never experienced in Japan. A British guide paper has awarded it as a top restaurant for 12 years straight. It's a well established eatery that faces the Merlion statue. They are proud to offer a flavorful menu of refined food from each Asian country. In Singapore and around Asia, this group has over 15 different brands and more than 40 restaurants. They have received many awards for their high quality and superior concept. 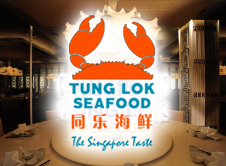 As a champion winner for the famous Singapore staple food, "chili crab," this restaurant is one of the most famous with over 2,000 customers daily. The super popular original recipe "chili crab"
The most popular dish on the menu is the "chili crab," made using high quality crabs called "mud crabs" that are seasoned with a thick chili spice and then roasted.At Singapore Seafood Republic, we are proud to say that the "Jumbo Seafood Restaurant" recipe has received the most awards in the chili crab competition. The appeal of these fully stuffed, richly seasoned mud crabs is that they are purchased and then flown directly from southeast Asia while still alive. Live mud crabs are not commonly transported domestically in Japan and they are hard to find in Singapore as well.Also, please indulge yourself with the spicy garlic and chili peppered "Fried garlic & basil crab," or a delicous naturally flavored "steamed crab" served as is, or other well known dishes. Copyright ©Ｍ・Ｒ・Ｓ, Co.,Ltd. All Rights Reserved.